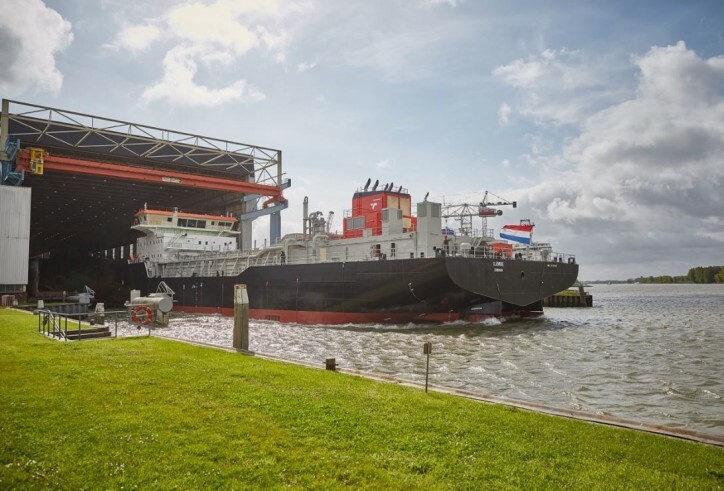 Royal IHC has successfully launched the Ilebme (IMO 9741891) trailing suction hopper dredger from its Kinderdjik shipyard in the Netherlands. The 5,500m3 dredger is currently being constructed for the purposes of South Africa’s national port authority that is Transnet National Ports Authority (TNPA). IHC was chosen to serve the role of supplier following a successful submission regarding an open tender process for what will turn out to be the biggest South African dredging vessel. The contract regarding the vessel’s design, building and subsequent delivery was signed in March of last year between IHC and TNPA. The keel-laying ceremony took place on January 8th of this year at the Kinderdjik shipyard. If all goes according to plan the vessel is to be successfully delivered to its Durban homeport in the early months of next year. The new ship will be jointing TNPA’s current fleet, consisting of IHC-constructed vessels, including the the 4,200m3 Isandlwana trailer that was delivered back in 2010 as well as the Italeni grab hopper dredger that was delivered last year. The Ilembe dredger is going to be employed for the purposes of primarily South African international seaports but might also be used for serving some other ports of the continent. The vessel measures at 101.1 meters LOA with a 22.4-meter beam and just a 6-meter draft. It is going to have the capability necessary to dredge to a 30-meter depth level via a single dredge pipe of a 900mm diameter. It will have a sailing speed of 11.9 knots thanks to a total installed power level of 7,669kW. Given that TNPA is among Transnet SOC Ltd.’s five operating divisions it holds responsibility for the safe, efficient and effective economic functioning of the national port system of South Africa. It is faced with managing eight commercial ports located along South Africa’s 2,954km coastline with two primary service categories: port infrastructure provision and maritime services provision (dredging and marine operations). Along the lines of the TNPA contract, IHC is going to carry out a supplier development (SD) plan for helping improve South Africa’s industry. According to the SD plan the primary objective is to develop a dredging operator school, including delivering a dredging simulator, in order for IHC along with TNPA’s maritime school of excellence to initiate a long-term co-op effort for providing training to local people. “We highly appreciate our company’s long cooperation history with TNPA. TNPA set requirements for a dredger that is highly reliable, resulting in an excellent dredging performance, low maintenance, high safety levels and high workability,” comments Fer Tummers, executive director for IHC.